I wish I had some better pictures to go along with this post, but if I wait for pictures, I'd post even less than I do now! 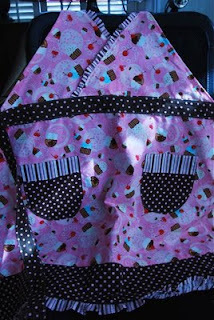 I used some great pink cupcake fabric, along with a stripe and a dot. I had orignally chosen another pink pattern, instead of the stripe, but after starting to assemble the apron, the colors just didn't do it for me. One challenge I always have is when there are directions and notes on the pattern pieces about numbered sides, or something to that effect. The two triangle tops of this apron had that, and I sewed them on backwards the first time around. The only other thing that I didn't like about the pattern was the width of the ruffle around the neckline. I found it really difficult to get the ruffle to lay the way I wanted it to, and it was almost like trying to sew a bias tape (which usually results in me cursing up a storm). Other than those two small nits, overall, I think the pattern was very well written. Directions were clear, and easy to follow. Steps were separate enough that I felt like I made real progress, moving from one to the next. OH! And the pattern recommends that you serge most of the edges of the fabric. This made for a really well-finished look to the apron when I was done. Poor picture and all, here it is. I'm 5'4", and it was actually really long on me, past my knees. So it would be a good apron for someone who is quite a bit taller than me. Also, the ties are really nice and long, so you can either tie it in front, or in back and make a nice size bow. One final note, the pockets ended up feeling nice and substantial. I was afraid that they would feel flimsy, as the seam allowance was small on the bottom, but they were a pleasant surprise when I was done. 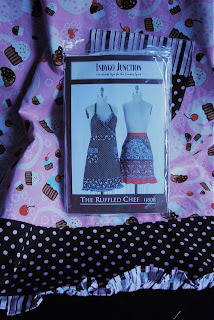 I'm hoping Laura loves her apron, and I'm looking forward to making more Indygo Junction patterned items soon! Love it! Did you know that I designed that cupcake fabric? Sold the design through a third party several years ago and was so happy to see that Kaufman was the buyer!